When ISLANDS magazine names you ‘One of the Top 20 villas in the World’, it’s always a good sign. It has tons of outdoor space, a bed in a grove overlooking the sea, a path to the beach, and a 24-hour concierge. You’ll be served by a full staff, with the option for a private chef. This villa has been painstakingly designed to replicate a true tropical paradise. Rated One of the TOP 20 Villas in the world! Bird of Paradise is a luxury villa located on a small bluff above Sandy Hill Bay. This vacation rental was designed in an Asian-Tropical style with meandering, lagoon-style pools that weave between four buildings and lush gardens. Sandy Hill Bay’s crescent-shaped beach is a short walk down the path, and its sheltered bay offers excellent swimming and snorkeling as well as a safe harbor for a small yacht. A large Indonesian daybed is situated in a grove of palm trees to the side of the villa and is perfect for massages and naps. The villa has a long, winding pool that runs along the foyer, master suite, common area, and back terrace. A bridge runs overhead for easy access from the living room to the master suite and a sundeck sits at the edge of the wading area. Palm trees and bougainvillea border the pool without obstructing the ocean view. Bird of Paradise offers multiple sitting areas both inside and out, with a fireplace, gas grill, lounge chairs, and dining tables. 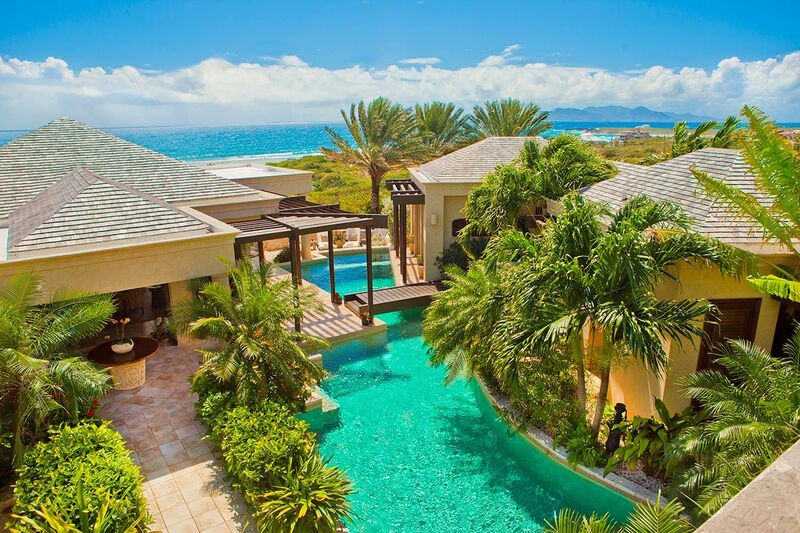 Anguilla’s outdoor ambiance is captured in large verandas and terrace patios throughout the property. At the front end of the villa, there’s a deck nestled in a palm grove with a hammock and a dining table. The villa offers true indoor-outdoor living with walls of folding doors and high ceilings. The interior living room opens to the ocean view and has Balinese furniture, including an ornately carved armoire that hides the flatscreen TV. It connects to the formal dining room and dining veranda. The wet bar and kitchen are fully equipped with modern appliances, a coffeemaker, an antique Chinese work table, and access to the outdoor living area. Each of the villa’s suites are designed to act as their own retreats with a veranda, panoramic view, mini fridge, coffee service, and ensuite bathroom. Two suites have king beds, one suite has two queens, and one has two twin beds that can be made up as a king. The king suites have whirlpool bathtubs and outdoor showers in their ensuite bathrooms. Frette linens and Bvlgari amenities enhance the home’s tropical luxury. The office provides a fifth bedroom and is attached to the twin suite. It has two daybeds, a TV, a DVD player, and access to a private terrace. Two daily housekeepers, a concierge, manager, and laundress will maintain the villa’s interior. Perfect for holiday retreats, weddings, or family reunions, Bird of Paradise offers a home away from home. Golf, scuba, fishing, restaurants, and nightlife are all within a short drive. • Michelle, your concierge will make on-island arrangements and meet and greet you outside of Customs. • The Villa Host will give you a cell phone, so you may contact her from wherever you are on the island. • The Villa Greeter will greet you at villa and assist with luggage. • Beach attendant to set up chairs and umbrellas. • One time pre-stocking of kitchen and bar prior to arrival. • 5 star amenities including Bulgari, Voss water on arrival, bathrobes and more. • Surprise gifts during the week. - Chef Service is not included in the standard rates. You have the option to add chef service for any meal at an additional cost. Depending on the number of chef services you add, this is a more expensive route than purchasing a package where the chef is included for all meals which reduces the rate for weekly service. • Car and driver for arrival and departure. • Chef offers welcome cocktail party with rum punch, champagne cocktails, and hors d’oeuvres. • Grocery shopping included daily. • Butler/server for lunch or dinner up to 4 hours daily. • Chef for second meal daily. • Butler/server for lunch and dinner up to 8 hours daily. • Chef included for third meal daily. • One to two rental cars depending on size of group. Please note that gratuities for independent contractors not included, i.e. driver, chef, and butler. There is a short 3 minute walk down a path to quiet Sandy Hill Bay Beach. Luxury Packages are available for different rates. Car rental, private chef, butler, server, grocery and beverage shopping (pre-arrival and during your stay), liquor and wine delivery, nanny service, baby equipment, spa services, yoga and personal training, photography, and private transfers/car service can be arranged for an additional fee.